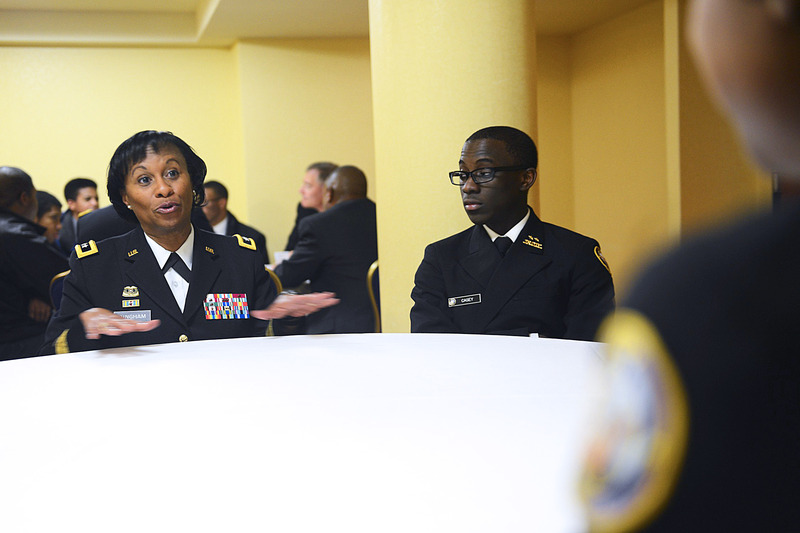 WASHINGTON (Feb. 08, 2015) -- Maj. Gen. Gwen Bingham sat at a small table in a tiny conference room, holding court with a group of African-American teens from area high schools, many of whom wore the military uniforms of their Junior Reserve Officer Training Corps program. Bingham, who serves as commander of the Army's TACOM Life Cycle Management Command, out of Warren, Michigan, was one of many military officers and Senior Executive Service civilians participating in a mentoring session with area high school students. Army Maj. Gen. Gwen Bingham, who serves as commander of the Army's Tank Automotive and Armaments Command in Warren, Michigan, mentors high school students during the 2015 Black Engineer of the Year Awards science, technology, engineering, and mathematics conference in Washington, D.C., Feb. 6, 2015. The mentoring was part of the "Stars and Stripes" portion of the annual Black Engineer of the Year Awards, or BEYA, science, technology, engineering, and mathematics, or STEM, conference at an area hotel. That conference is now in its 29th year. "They were very excited to be here and what I was so encouraged by is that they had so many mature questions for us," she said. "They have eager minds. When I think about our youth, I feel encouraged our future is in good hands." Bingham said the organization she commands -- formerly the Army's Tank-Automotive and Armaments Command -- is in great need of those eager minds, especially those who have graduated with STEM degrees. "I told them for each one of you who wants to be an information-technology engineer, or architect, or engineer of any type -- we could probably employ you if you so choose," she said. During the mentoring session, Bingham rotated from table to table, spending time with and answering questions from teens at each table. "They seemed very interested as we adults were talking about the places that we have been in our military careers and government civilian careers," she said. "I think they found it pretty cool, as one guy said to me, just to work with tanks and weapons systems and those kinds of things." Bringing young people together with successful adults, and having them interact, allows them to better visualize the opportunities that are available to them, Bingham said. "Programs just like this ... these kinds of opportunities just bring alive to young people some of the disciplines that they can do when they go through college and get their degree," Bingham said. "I am a visual learner myself. Just being able to visualize and see some of the programs that are out there would ignite a lot of fun and passion within the students." Bingham said that when youth see successful adults of diverse race and gender at conferences like the BEYA STEM conference, they recognize that there is possibility for them as well -- and this is the purpose of such mentoring sessions. "When young people see that, and they see examples of others who are involved in some of the areas that they are excited about, they pass that word around to their peers and it grows among student populations," she said.